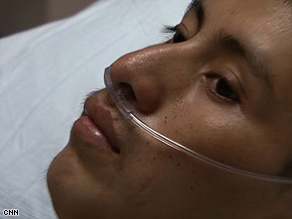 (CNN) -- Eighteen-year-old Juan Gonzalez was dying alone in a hospital, thousand of miles from his Guatemalan home. He was separated from the family he had traveled to the United States to help support. Juan Gonzalez was earning $250 a week as a dishwasher when his heart trouble began. Diagnosed with a chronically weak heart, without much money and lacking resources, Gonzalez seemed bound to die without ever seeing his parents again. That changed after CNN aired a story about his plight. Like many undocumented workers, Gonzalez came to the United States last fall to provide some financial help for his family, who had fallen on hard times back in Guatemala. He took a job as a dishwasher in Rome, Georgia, making about $250 a week. Then, in November, his heart gave out. Gonzalez has been in and out of the hospital for seven months. Doctors diagnosed Gonzalez with dilated cardiomyopathy, which means his heart muscle is very weak. Dr. Frank Stegall, Gonzalez's cardiologist, said the Guatemalan teen's heart pumps only 20 percent of the blood a healthy heart should. But as Gonzalez's heart failed him, he opened up the hearts of others. Stegall and the staff at Rome's Redmond Regional Medical Center were inspired by Gonzalez's attitude and courage and set out to reunite the dying teen with his parents. They contacted U.S. Rep. Phil Gingrey, R-Georgia. Gingrey got the State Department involved in expediting visas for Pascual and Maria Gonzalez, Juan's parents. Gonzalez has vowed to fight to the end, but doctors say his prognosis isn't good. With no money, Stegall says, it will be tough for the teen to get a heart transplant. Now, after traveling thousands of miles for more than two weeks to make a better life for his family and himself, Gonzalez faces his final fight, but it's one he will face with his family, thanks to the kindness of others.